At just 4.42 lbs, the SVS15125CXB Sony 15.5" VAIO S Series Laptop in Black offers stepped up performance, all day mobility in a sleek, full-flat design. Features like Full HD display with IPS technology, slot-loading optical drive, large clickable touchpad and backlit keyboard are standard. Get even longer battery life with the optional extended sheet battery. 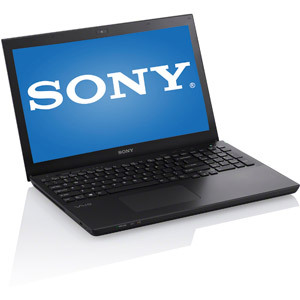 Equipped with a 3rd generation Intel Core i5 processor, a NVIDIA GeForce GT 640M LE graphics card and 8GB of memory, the Sony Windows 8 Laptop Operating System is an ideal solution for your mobile computing needs.